Cuito — Angola will present in January 2018 an Emergency Malaria Programme aimed to set strategies to reduce the incidence of this disease. The minister of Health, Sílvia Lutucuta, said last Saturday that the programme - which will count on the contribution of the sectors of Environment, Energy and Water, Finance, Mass Media and Urbanisation - will guarantee, in short term, the reduction of malaria mortality in Angola. 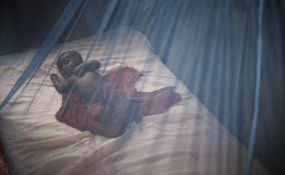 The official did not disclose figures of malaria cases reported in the country, however she also said that the Malaria Emergency Programme will rely on the intervention of traditional and religious authorities, which will help to disseminate ways of prevention and improvement of basic sanitation. In addition to public awareness, she said, the strategy also aims to strengthen the distribution of medicines and mosquito nets in the country's hospitals, training and promotion of health professionals. Sílvia Lutucuta delivered medicines kits and mosquito nets treated with insecticide in the municipality of Cuito, central Bié Province, in a ceremony witnessed by the provincial governor, Álvaro de Boavida Neto. The minister appealed to hospital managers to take greater responsibility for the distribution of drugs and mosquito nets, avoiding inappropriate use of goods to the detriment of poor families.